The earliest Vermont settlers, like our own Timothy Dakin, learned that when Pure Vermont Maple was used to sweeten and season meat, then that same meat was smoked over glowing corn cob embers, magic would occur. 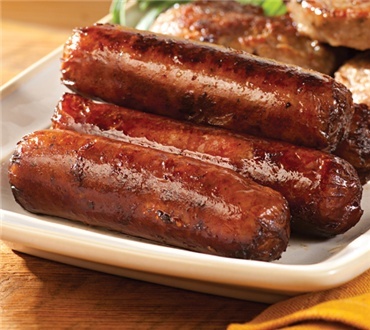 At Dakin Farm we are proud to carry on this centuries old tradition in our most popular big link smoked maple sausage. Two 1 lb. packages per order. This is easy to prepare and also freezes well. We are no longer "locals" as we have moved to Wyoming from Vermont and this reminds of us the many pancake breakfasts eaten at the sugar house in Ferrisburgh. A local foodie that we shared this with raved about the flavor and "snap" of these sausages. Good thing that you included a catalog with the order to give to him! We put these in a small amount of water or just slice them up & fry them and love the taste.